Sample mp3 Track: "Winnie's Crossing"
Grand Stick with the PASV-4 pickup. Open to page 17 of Emmett Chapman's Free Hands method book and there you'll find a photo of Leo Gosselin, then of Winnipeg, Canada. 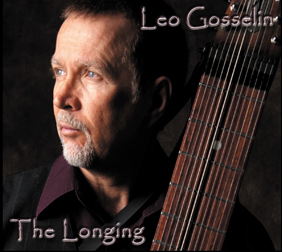 This early adopter of The Stick and the Free Hands method has just released his eighth CD, "The Longing", and is touring Southern California Wineries in November and December. Leo came to the Stick in 1976, after playing guitar for eleven years. Since that time he's performed all over North America, and recently relocated to the Southwestern U. S., where his relaxed style fits in perfectly at art fairs, festivals and wineries. Leo's masterful playing, on this live rendition of a track from his new CD, highlights his fluid soloing, memorable melodies, and gift for harmonic surprise. His arrangements are laid back but full of motion and emotion, his left hand always driving the music forward, and his right "singing" his memorable melodies. It's a classic approach to two-handed tapping, that Leo delivers with ease and grace. "I wanted the various pieces to convey the emotional elements that live within us, the most powerful of all being love." Most of the pieces are solo, performed on a PASV-4-equipped Grand Stick with (only one over-dubbed solo on track 5). They range from mellow jazz ("Gypsy Shuffle", "No Going Back"), pop ballads ("Memory Meadow", "Sacrifice of Love", "Trail Flowers", "Without You"), Baroque-stylings ("Winnie's Crossing", "Thoughts of You"), with lute-like tones and harpsichord ornamentations, Celtic ("Seaward Waltz", "Spanish Circle"s) and folk ("Country Sun"). Leo's subtle use of the different filter and pickup settings on the PASV-4 adds to each tune's distinctive feel. Sometimes he goes for a warm "jazz guitar" tone, at other times it's brighter, more "acoustic". When using the same settings on both sides The Stick sounds like one giant extended range instrument, and with different settings on bass and melody the distinctiveness of each hand's part comes through. Even on more relaxed pieces his left hand is constantly in motion, a singlular finger-style rhythm section all on its own, supporting his lyrical right hand. You played guitar for eleven years before taking up The Stick, in an era when there were not models to draw on, except for Emmett's own work. How did it relate to the guitar for you? 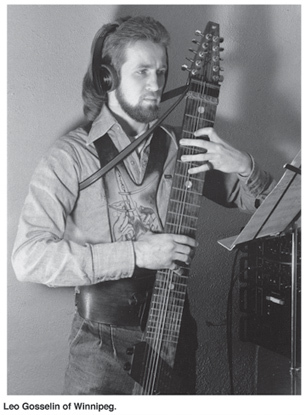 At the time I ordered my first instrument, I had no awareness of Emmett's own work, performing with his invention. My first experience of it was seeing someone attempting to play it in an "uncrossed hands" technique and although it looked rather awkward, he did manage to impress on me the potential of the instrument. I didn't attempt to actually play The Stick until four months after having ordered it. I had no idea what I was getting myself into at the time. As far as The Stick relating to the guitar, after finally having had the opportunity to get the instrument in my hands, I came to a rather quick conclusion that The Stick was going to be a handful and to really tackle it with conviction, I decided to give up guitar entirely. Personally, I felt I needed to devote all my energy to the study of The Stick rather than splitting it so to speak. It was a whole new ballgame for me. This is your first all-original release. Since you're not adapting someone else's music to The Stick, can you tell us a little about your writing process? Do you start from chord progressions and add in melodies, or does the harmony build around these very catchy tunes? Sometimes, I would get bits of melodies in dreams and would get up to write them down. Then look at them the next day and work some chords around them. Typically, I sketch out a tune keeping in mind the emotive essence I'm trying to capture whether sadness, joy, or pain, and working out a harmonic framework in which to suspend the melodies. I do love beautiful melodies, whether simple, complex, syncopated, or otherwise. There's an elegant timelessness that manifests in melodies that come from the heart. I try to keep that attitude alive when I'm creatively sketching something. I have a keen interest in Latin and Spanish music at the moment with its "Grand Palette" of colors, rhythms, and emotive qualities. I can see myself going in that direction for my next project although it may be a while. I'm currently studying pieces that have the potential of providing me with enough varied components to mesh together a Stick arrangement that may be complex or simple but essentially conveys a fluid and heartfelt performance. I feel this process also lends itself to breed new technical challenges as well. I see myself a lifelong student at heart.